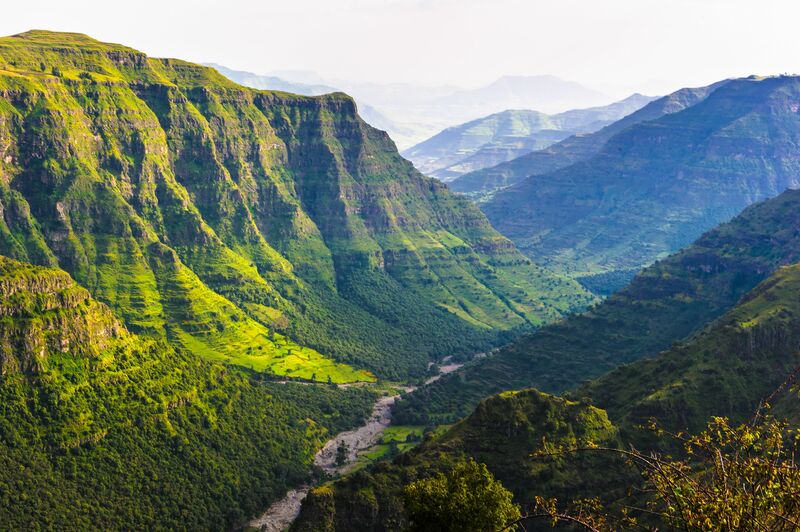 This journey combines the very best that Ethiopia has to offer from the rock-hewn churches of Lalibela to the lesser-visited Bale Mountains and medieval castles of Gondar. Start your Ethiopian adventure with a flight to Addis Ababa. From here you will fly to Bahir Dar where you’ll be staying right on the shores of Ethiopia’s largest lake. You will then travel to the Simien Mountains for a few days, where you will most certainly encounter troops of the endemic Gelada baboon. Next stop is Gondar to discover magnificent medieval castles and the famous church of Debre Berhan Selassie. You continue to the Bale Mountains via Axum, Lalibela and the Tigray Gheralta area – a unique chain of mountains and the home of many rock churches, some famous for their architecture and others for their majestic views. After stops in Yirga Alem and Arba Minch, you’ll finish your journey in the Omo River Valley where you’ll be able to experience the untouched culture of some of Africa’s most colourful and traditional tribes. Full board at Kuriftu Resort, Limalimo Lodge, Mayleko Lodge, Maribela Hotel, Sabean Hotel, Gheralta Lodge, Bale Mountain Lodge, Aregash Lodge, Paradise Lodge and Kizo Lodge. Based on two people travelling. Catch an Ethiopian Airways overnight flight from London Heathrow to Addis Ababa, connecting with an onward flight to Bahir Dar. Capital of the Amhara region in northern Ethiopia, Bahir Dar sprawls along the southern shores of the enormous Lake Tana. Approximately 50 miles long and 40 miles wide, Lake Tana is Ethiopia’s largest lake and the source of the Blue Nile. It’s best known, however, for its centuries-old island monasteries which are rich in paintings and other hidden treasures. They are even believed to have once housed the Ark of the Covenant. Leaving the glimmering waters of Lake Tana behind, you will be transferred by road to your lodge in the rugged Simien Mountains. This will be your base for excursions in this mighty wilderness, a region recognized by UNESCO as a World Heritage Site on account of its unique wildlife and stunning landscapes – landscapes that feature 25 peaks that rise above 4,000 metres (sometimes referred to as the Roof of Africa). You can spend your time exploring hiking trails that cut through the national park, enjoying picnic lunches and visiting various viewpoints. During your excursions keep an eye out for the endemic Gelada baboon, distinguishable by its shaggy coat and the bright red patch on its chest. Gondar, nicknamed the Camelot of Africa, is your next port of call. The city was the capital of Ethiopia in the 17th century and retains many of the medieval castles and churches built between the periods of 1632 and 1855. The Palace of Ras Bet, the Bath of Fasilides, the crumbling Palace of Kusquam and the Church of Debre Berhan Selassie – with its elaborate painted ceiling – all provide an incredible insight into the legacy of Ethiopia’s former emperors. Staying just 15 minutes from the city centre, you’ll enjoy a tour of the Royal Enclosure with its banqueting halls, chancellery, library, Turkish steam bath and lion cages. Today you catch a flight to what is one of the greatest historical and religious sites in the Christian World. The monolithic, rock-hewn churches of Lalibela – constructed between 1137 and 1270 – are simply astounding. Carved away from the rocks themselves, the churches are incredibly intricate and exceptionally well preserved. Your afternoons can be spent exploring the area and visiting the church of Bet Medhane Alem – the largest rock-hewn church in the world – and the Bet Girorgis which is spectacularly carved in the form of a Greek cross. You’ll also have the option of walking to the church of Asheten Mariam which involves a hike up to the summit of Abune Yosef. Another flight brings you to Axum, site of the historic capital of the Kingdom of Axum – one of the most powerful kingdoms in the ancient world. It sat at an important trading route between Egypt, Sri Lanka and India, and was known for being affluent, well organized and technically advanced. You’ll visit the area’s impressive stalae fields studded with dozens of monoliths, each of which is carved from a single piece of granite – the largest of which weighs 517 tonnes. You’ll also discover the ruins of Queen Sheba’s palace and the tombs of King Kaleb and Gebre Meskel. Yet more ancient treasures await in Gheralta at the heart of Ethiopia’s beautiful Tigray region. Here, amidst a dramatic mountain landscape, you’ll discover over 200 magnificent stone churches and monasteries built between the 7th and 18th centuries – many with colourfully decorated interiors. The region is also known for its bird watching, with a variety of species to be spotted in the surrounding rocks and ficus trees. Today you fly back to Addis Ababa where you will connect with an onward flight to Robe. From here you will be met and transferred to your lodge in the Bale Mountains National Park, a remote and beautiful area of moorland and cloud forest where you’ll find a staggering array of rare and endemic wildlife. Staying in a luxury lodge at the heart of this pristine wilderness, you’ll head out on forest expeditions in search of warthogs, giant mole rats, lions, bushbuck and various primates, including the endemic Bale monkey. You’ll also visit the Sanetti Plateau which is home to the world’s largest population of Ethiopian wolves. Today you’ll drive to Aregash Lodge in the town of Yirga Alem. Nestled amongst acres of gardens, coffee fields and indigenous forest, you’ll be able to enjoy some much-deserved rest and relaxation surrounded by nature. The nearby forest is full of unique flora and fauna, whilst mountain biking, horseback tours and visits to coffee plantations, historical caves and hot springs can also be arranged. Located at the base of Ethiopia’s Great Rift Valley, Arba Minch is a real hidden gem with a lush, green environment and plenty of wildlife viewing opportunities. Nearby attractions include Nechisar National Park where you’ll find many lakes and bubbling springs as well as gazelles, zebras, baboons, kingfishers, storks and fish eagles. You can also visit the nearby villages of Konso and Dorze to see and experience the local’s traditional way of life. Your last stop is Jinka, a market town north of the Tama Plains. You’ll head to your lodge at the heart of the Omo River Valley, a remote region where over 200,000 tribal people have lived for centuries with virtually no influence from the Western world. During your stay, you’ll be able to witness their ancient traditions and ceremonies, getting a much deeper insight into their unchanged way of life. As well as a rich indigenous heritage, the region has been designated a UNESCO World Heritage site thanks to the invaluable fossils that have been uncovered here, allowing scientists to trace modern human civilisation back 160,000 years. Catch a flight from Jinka airport to Addis to connect with your Ethiopian Airlines flight back home to London.